Crafting is a great way to express one’s creativity. But it involves a lot of trial and error. I thought it would be fun to share some of my failures for a change. 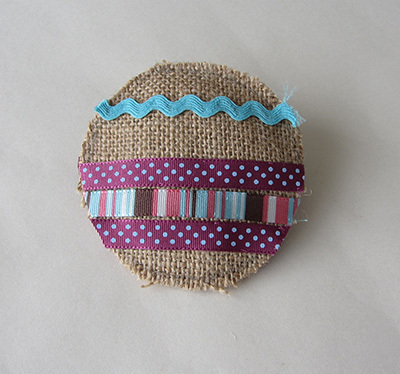 Today I show you an unsuccessful attempt to make a burlap and ribbon based Christmas ornament. I picked lovely materials: some burlap and assorted ribbons so I thought I could not get it wrong. But I did. And boy, how did I laugh when I stepped back and had a proper look at what I had done! The ribbons were supposed to embellish the burlap, not to hide it. The circle shape has been drawn on the right size and is therefore showing. And the circle is not even circular. The burlap is fraying and where the hell am I supposed to put the hanging loop? There was a happily ever after as I finally managed to get it right, as shown in the tutorial I shared on Tuesday. It is good to have a good laugh, even if laughing at your own creation. Good for you for sharing this. It is always great to know that you are not the only one who makes mistakes!! !